I am a member of the Collective Bias® Social Fabric® Community. This shop has been compensated as part of a social shopper insights study for Collective Bias and their client. As always, all views and opinions are completely my own. It’s official. The final year of my twenties has officially begun. I’m 29… and we aren’t even going to begin talking about that number that’s going to happen next year. Anyway, I was super excited to celebrate my birthday with attending the first of four Family Dinner’s with Mario Batali’s Chefs this past Sunday. 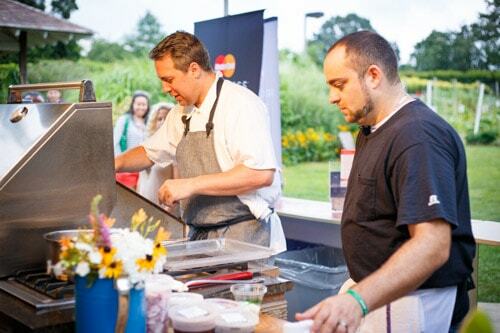 Sponsored by MasterCard’s Priceless New York program, it was a fun, enjoyable, and unique evening to spend time in the New York Botanical Gardens, watching a culinary demonstration and enjoying a perfect summertime family dinner. As we arrived to the Ruth Rea Howell Family Garden, we were encouraged to explore their beautiful, meticulously maintained vegetable and herb garden. 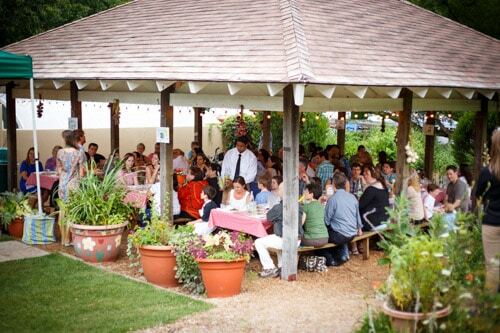 It’s way too massive to capture in a single photo, and is pretty much the dream garden for any culinary enthusiast. 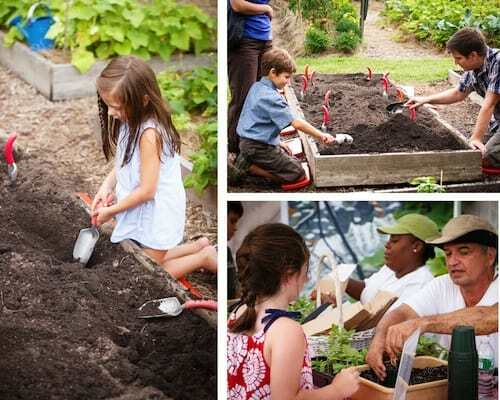 The garden is divided into different sections, with some reserved for children’s programs and others for a “world garden”, where families can sign up to maintain a culturally diverse planting bed. 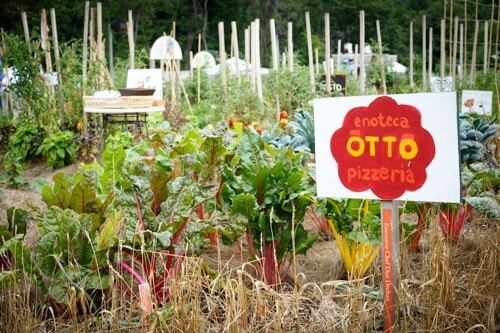 A large portion of the garden, however, is reserved as Chef Mario Batali’s Kitchen Gardens, where his chefs grow various vegetables and herbs to be used in their restaurant kitchens. As we perused the grounds (and I quietly weeped on the inside from it’s beauty and the knowing that my garden will never be this perfect), there were various interactive kid-friendly gardening activities. I love this. With children knowing where their food comes from and taking part in the process, they will hopefully be willing to eat more whole foods and less processed junk. 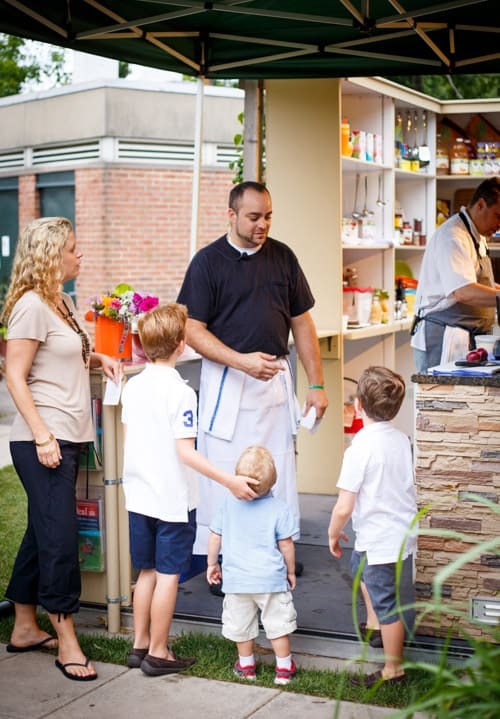 Babbo Executive Chef Frank Langello took some time to talk with families as he was prepping dinner in the Whole Foods Market Family Garden Kitchen. 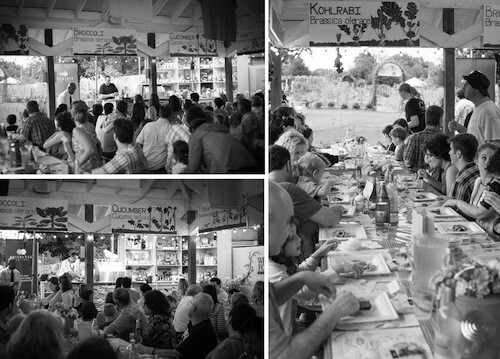 And then our intimate evening began, as we took our seats for dinner and a culinary demonstration of each of the three courses. Perfect timing too, as the clouds began to release a steady rain just as everyone was underneath the giant gazebo (is that a gazebo? …Asheley and I couldn’t figure out what to call it). 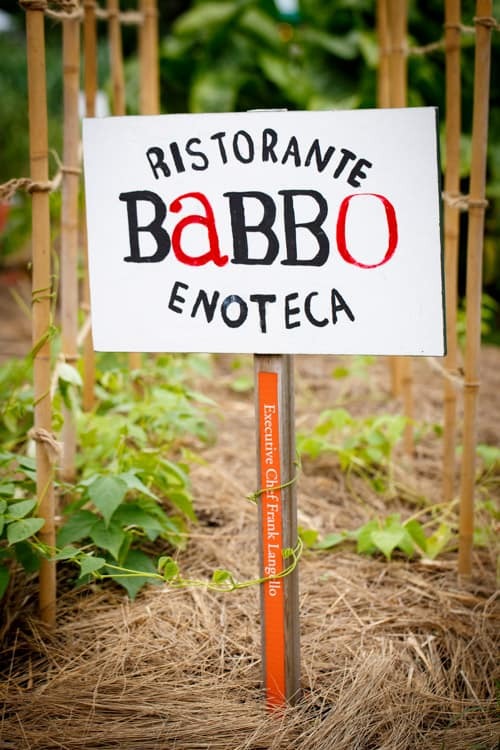 Each of the four Family Dinners with Mario Batali’s Chefs will be hosted by different chefs from his vast New York restaurant empire. 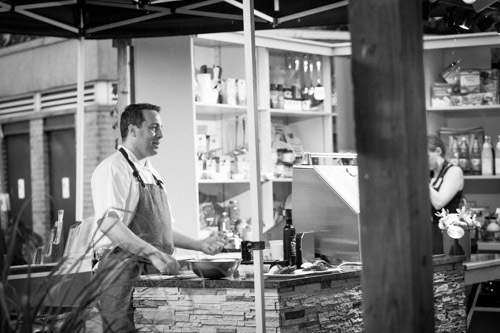 We were very excited to have Babbo Executive Chef Frank Langello and Lupa Chef di Cuisine Cruz Goler on hand for the evening. 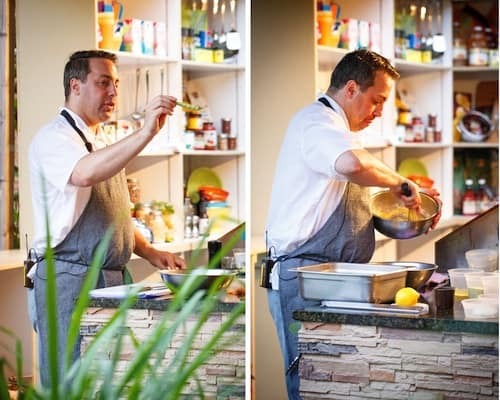 They graciously demonstrated and talked through each of our three courses, including answering any questions and offering some culinary tips along the way. Both were very personable and really made the evening special. And let the eating begin. The food was simple, yet perfect. 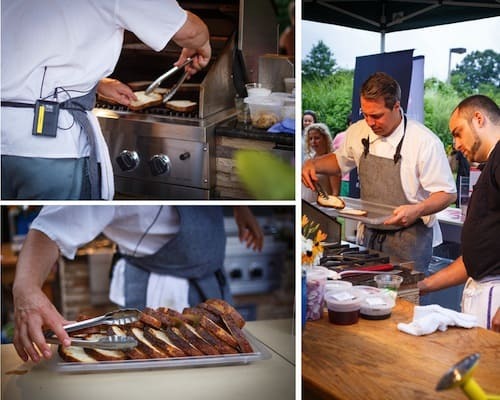 A celebration of clean and fresh summer flavors, with top-notch ingredients (many right out of the garden), and all prepared with the skill-full touch of our two host chefs. Simple food is usually the easiest to screw up. The ingredients have to be at their peak. The seasoning and preparation has to be perfect. There is no hiding a mistake. And there was none here. The meal was executed flawlessly. 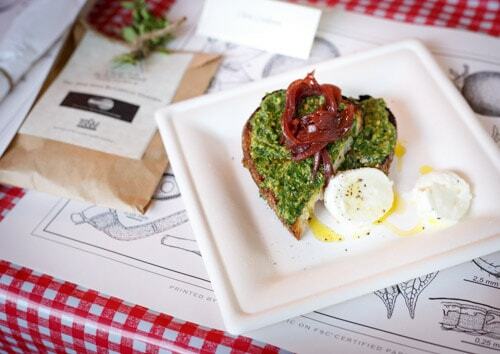 Our first course was Crostini with Arugula Pesto, Red Cipollini Modenesi, and Mozzarella di Bufala. I would easily eat 10 more of these. Everything, from the expertly char-grilled bread to the salty, creamy mozzarella was sensational. Asheley’s favorite part were those bright and acidic onions. 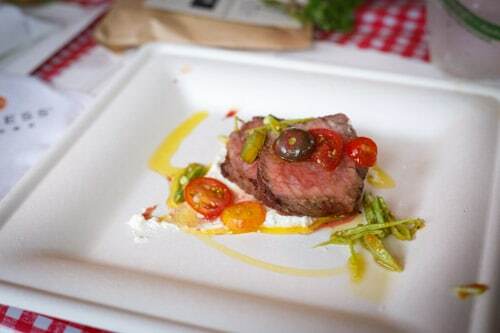 The second course was this Strip Steak with Whipped Ricotta and Runner Bean and Tomato Salad. The steak was so tender and the light and creamy ricotta, which was whipped with olive oil and studded with little flecks of herbs, made for a perfect “sauce”. And is there anything better than summer tomatoes? 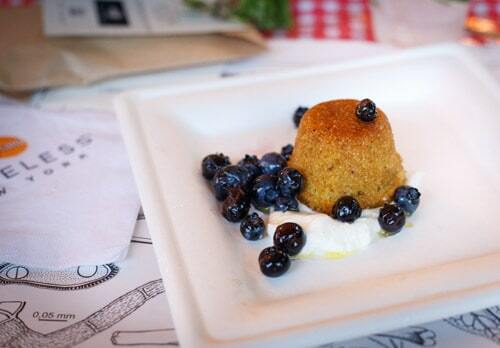 The Pistachio Olive Oil Cake with Macerated Blueberries was a light and refreshing way to end the evening. 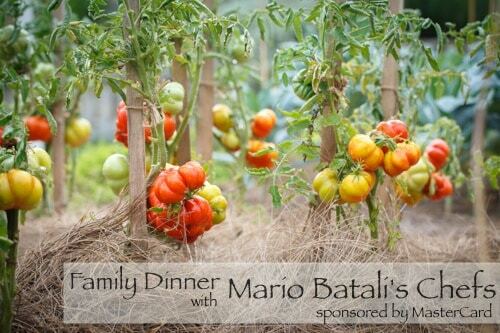 We had such a fantastic time at this inaugural Family Dinner with Mario Batali’s Chefs. 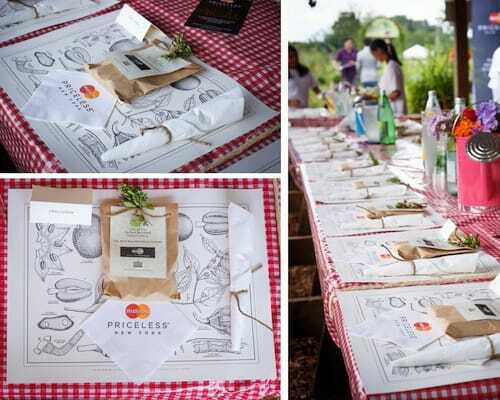 Thank you so much to the New York Botanical Gardens and the sponsor for the event, MasterCard. Good news for all of you who are MasterCard credit card holders: you can sign up to receive invitations to events like this at their Priceless New York website. 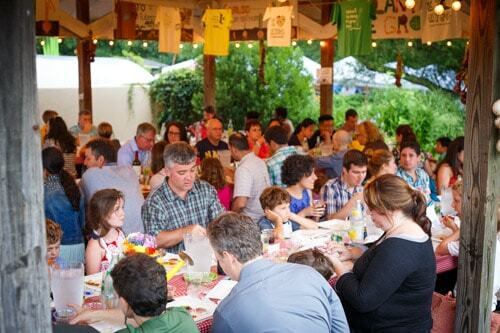 There are three more of these Family Dinners, as well as countless other culinary, sporting, music, and shopping events and adventures available! Definitely check it out and create your own Priceless Experience! Looks like such a great event for families! I love that you can have an experience this right in NYC!